Erasmus Darwin was one of the key thinkers of the English Enlightenment, was a member of the Lunar Society of Birmingham. A brass rubbing — see image to the left — has been placed near the Erasmus Darwin statue in the Museum Garden. 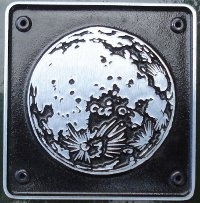 This forms part of the recently created Swinfen Broun history trail, a series of eight brass rubbing posts located in Beacon Park and on Minster Pool Walk. Thank you to Erasmus Darwin House for contributing materiel to this website. The entire history trail can be viewed here. The exceptional Erasmus brass rubbing, some historical information and details of Erasmus Darwin House can be viewed here.